Ketchikan, Alaska - At approximately 2:15 pm Friday, the Ketchikan City Fire and Police departments responded to a call of a car that had driven over an embankment at the 2700 block of Tongass Avenue. 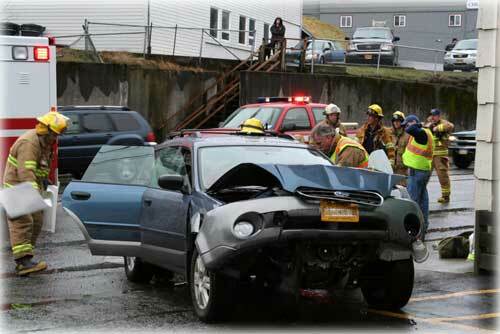 Although there was no official comment regarding the incident, a bystander said it appeared that the car traveled from the Presbyterian Church parking lot onto Second Avenue going through a fence, over an embankment and landing on Tongass Avenue. unidentified driver after car goes over embankment. The car came to a stop in the Harbor Master Condo driveway where the unidentified driver was extricated by Ketchikan Fire Department personnel and transported to Ketchikan General Hospital. It is unknown at this time if there were any injuries.